Stone Age Man Escape info about the game-Games2Rule. 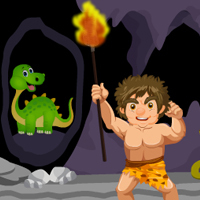 Stone Age Man Escape is another new point and click room escape game from bigescapegames.com. In this a dinosaur tried to attack a stone age man. He ran away from dinosaur and hide inside a cave. But the dinosaur was waiting outside of the cave for stone age man. No is there to help that stone age man. You have to help the stone age man from the dinosaur. Escape from there by finding useful objects, hints and solving puzzle. Click on the objects to interact with them and solve simple puzzles. Good Luck Have Fun!